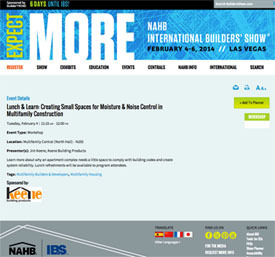 Check out Keene at NAHB IBS 2014 in Vegas Starting Today! Stop by our booth and learn more about our building envelope and noise control products from Keene. Our products include: Driwall™ products for drainage and ventilation, Quiet Qurl® for noise control underlayments, and our Acoustical Assurance™ line of ceiling isolation products for noise control. We offer four approved AIA courses. You can also learn more about Cansto Coatings and Dependable Floor Products. Please inquire for more details. We look forward to seeing you there. Learn more about why an apartment complex needs a little space to comply with building codes and create system reliability. Lunch refreshments will be available to program attendees.